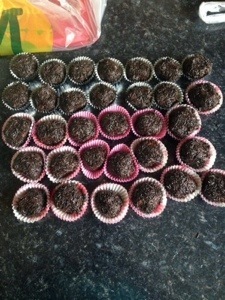 My lovely sister in law, Kim from Life of an Auntie makes these boozy brandy truffles every year. Let me tell you, they are usually demolished within seconds. She’s so far taunted me with these pictures, and I know that there is a box waiting to be eaten at my parents. 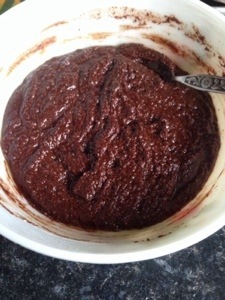 Break about two-thirds of the chocolate into a bowl and put this over a pan of hot water. Add the alcohol and leave to melt. Take off the heat and stir in the butter, which shouldn’t be too hard. Mix in the sieved icing sugar and ground almonds until well blended. Leave in a cool place until the mixture is firm enough to handle. Divide into about 16 even sized pieces and roll into balls. Grate the remaining chocolate, place on greaseproof paper and roll the truffles in it – you could also roll it in those chocolate hundreds and thousand bits. Put into the little cake cases. These are gorgeous. A little tub of them would make a fab gift – if you could resist eating them first!! Thanks to Kim for sharing the recipe and for the photos! Oh how lovely are these. A fab recipe. Happy New Year. Oh my! These look so yummy. I will definitely keep this recipe and make them for next year’s holiday. Nearly time for me to starting making these again.